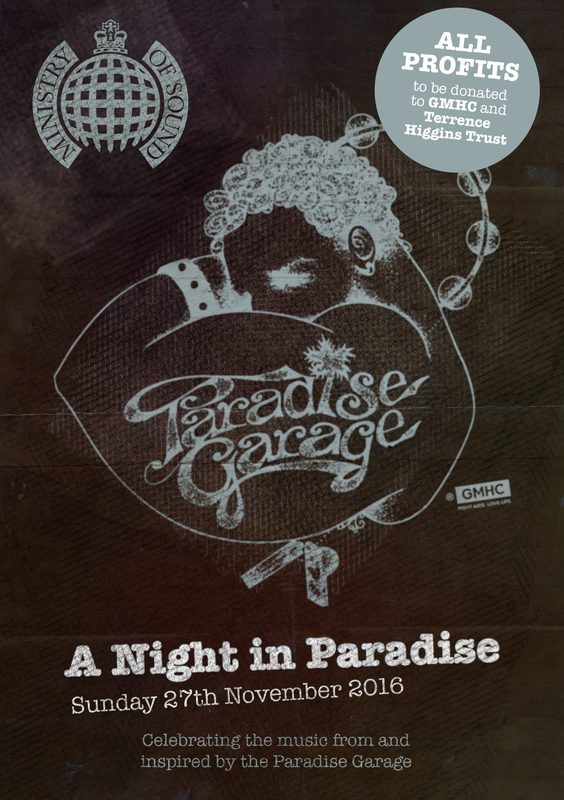 On Sunday November 27th I head to the Ministry of Sound in London for the A Night In Paradise – daytime International Aids Day fundraiser dedicated to all things Paradise Garage. I will be joining hands (and record collections) with Terry Farley, Dave Kendrick, Jamie Bull and Martyn Fitzgerald aka the HANDSOME family to tear the roof off the Baby Box. There’s pure royalty in the house in the other rooms too … Check press for full details. And GIVE GENEROUSLY. All proceeds go to GMHC and the Terrence Higgins Trust. As Homer’s Odyssey is to western literature, The Paradise Garage is at the cornerstone of modern dance music and its culture. Having attained almost mythical status, this ground-breaking club and the man at its musical helm, the legendary Larry Levan have had a profound and lasting effect on the music we listen to and the clubs that we listen to it in. From its inception in late 77′ this “Paradise” in a former parking garage for trucks offered gay men, and indeed all its members, including a post 70’s liberated woman some relief from the mundanity of every day life, and the dog-eat-dog reality of an almost bankrupt and wholly unforgiving New York City. The dance floor at Levan’s ‘Saturday Mass’ was a place given over entirely to the enjoyment of music. There was no pretence and no attitude; there weren’t even any mirrors to distract you. There was only you, Larry and the music. Disco, Philadelphia Soul, Funk, R’n’B and a new emerging genre which we now know as ‘House music’ were all staples, but boundaries in music fell down too here; There was only one real rule – if you could dance to it, you could play it. During the AIDS crisis at it’s epicentre in the early 80’s, aside from hosting the worlds first ever HIV benefit ‘Showers’ in 1982, The Paradise Garage was invaluable in providing a support network for those affected by this not yet fully understood disease. The dark lesions that Kaposi’s Sarcoma left on its victims’ skin meant doors all over the city were closing to them; clubs, restaurants, bars, even their family homes and churches. Not here though, the door was always open, this was their home, their family and their church. Paradise may have been lost, when over two weekends in Autumn 1987 over 5000 people made their pilgrimage to say goodbye to No84 King Street, but we can hold up the The Garage as a reminder of all it stands for, and the message of unity, love and respect in its music. We want to uplift the music, the memory and people from what was perhaps the greatest party that ever was; The Paradise Garage, yesterday, today, tomorrow and forever.